This kind of Dialpad Corded Telephone and headset can greatly increase your work efficiency. You just need to plug the line cord into the wall telephone port and you are ready to make and receive phone calls. 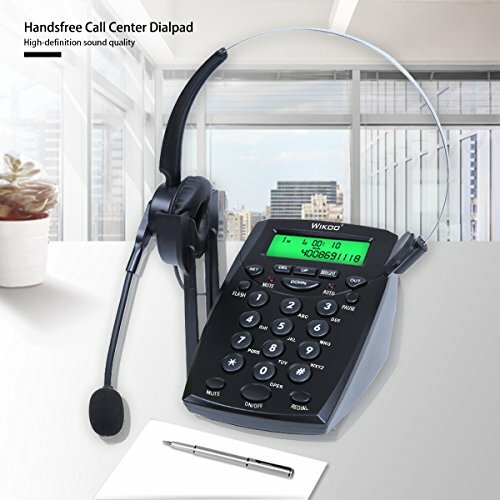 Using this handsfree telephone,you can work on your computer or take notes at the same time. HANDSFREE: With this handsfree telephone,you will get rid of holding a phone in your hand. It is the best choice for anyone who spends a lot of time on telephone. COMFORTABLE HEADSET: The headset is comfortable to wear for all day use.The noise cancelling microphone provides high quality sound clearly. VOLUME ADJUSTMENT: Headset speaker volume can be controlled by a knob on the left side of the telephone. GOOD QUALITY: This telephone is light and hard,it is both portable and endurable. Letters which printed on the telephone is clear to read and use.Powered by the phone line itself, no batteries needed. APPLICATION: For Phone sales, Telephone Counseling Services, Insurance, Hospitals, Banks, Telecom operators, Enterprises,etc. If you have any questions about this product by Wikoo, contact us by completing and submitting the form below. If you are looking for a specif part number, please include it with your message.